What spurs women to take action related to enjoying cultural events, and what would make women more likely to take action? As part of the POPSUGAR Insights Content, Commerce, and Culture study, we surveyed over 1,500 women between the ages of 18-44 and asked them to share what would make them more likely to read, watch, share, or post something online that's related to a cultural event. 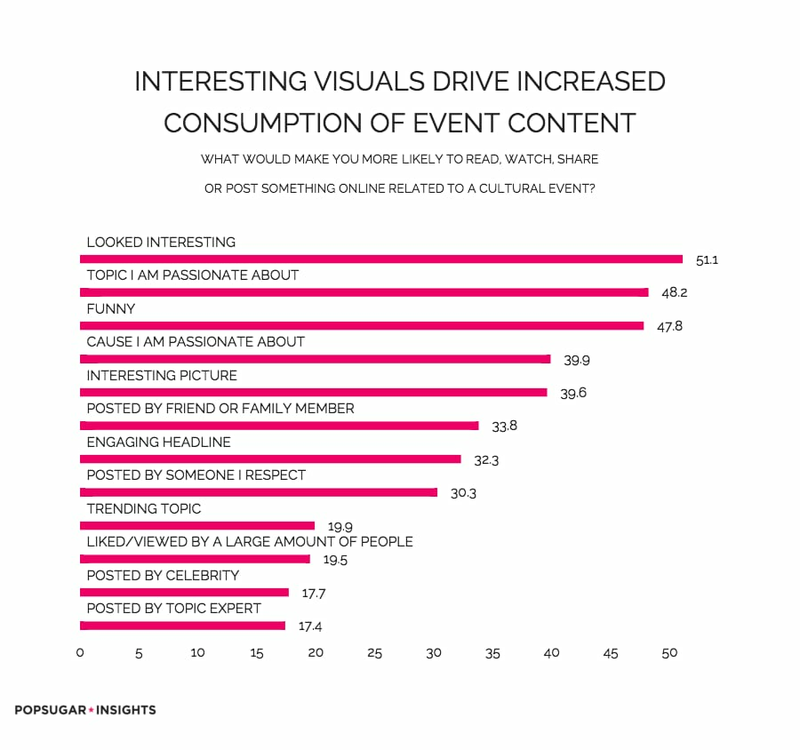 Overall, 51% of women said that they would consume, share, or post more content related to a cultural event if it looked interesting, proving the impact of high-quality visual content. Forty-eight percent of women said that they would consume, share, or post more if it was directly related to a topic they are passionate about. Humor is an incredibly important consumption-driver as well, and 48% of women said they would consume more if the content was funny. Certain drivers are directly related to the construction of the post, and women said that they would be more likely to consume if the post had an interesting picture (40%), had an engaging headline (32%), was classified as a trending topic (20%), or was liked or viewed by a large amount of people (19%). The person who is originally sharing the content can also be an important driver for driving women to consume more. Women would be more likely to consume event content if it was posted by a friend or family member (34%), was posted by someone whose taste they respect or admire (30%), was posted by a celebrity (18%), or was posted by someone with a specific topical expertise (17%).